So the Enquirer wrapped up a pretty interesting feature Sunday with the results of its inaugural State Of Our Sports survey. For some reason, I couldn't find the link to the raw results online anymore, but fortunately I was able to find it in my history. "Given the expectation that the Bengals would mount a lengthy playoff run - instead of not even starting one - a nearly irrefutable case can be made that the recently completed season is the most disappointing in team history." The survey results reveal a lot of anger and frustration - most graphs looked like this one. In all but one question's results, the most negative or pessimistic choice was picked the most. The open comments at the end were pretty funny. I liked these two the best, and couldn't agree more. - I don't need 250, all I need is two: Mike Brown. 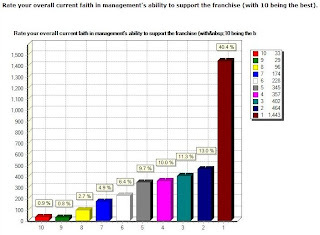 - The franchise is like it was 17 seasons ago...a failure. The most important issue facing and biggest obstacle is the Brown Family. In 17 years, players have come and gone, coaches come and go and its the same result. 0 playoff wins in 17 years. 1 winning season in 17 years (everybody catches lightning in a bottle every once in a while). Marvin was successful in Baltimore, Chuck B. was successful in Oakland, Leslie Frazier has been successful in Indy & Minnesota. The ONLY constant in 17 seasons is the Brown Family. The only variable that hasn't changed is "how the ORGANIZATION is run from the top." Until they sell the team, this will NEVER change as Mike Brown proved in the papers last week. I am only 30, so I was hoping to outlive the Browns, but I don't think it will happen."